Jakarta’s central business district has some iconic buildings such as City Tower, the Energy building, FX mall and Senayan City. At night, these buildings are equally dramatic, with their exteriors lit up in a swirl of colors and patterned lights. The interiors are equally exceptional. The lighting of all these buildings is the work of one firm, Litac Consultant. The firm, whose formal name is PT Litac Konsultan, is run and owned by Paul Gunawan and his partner. 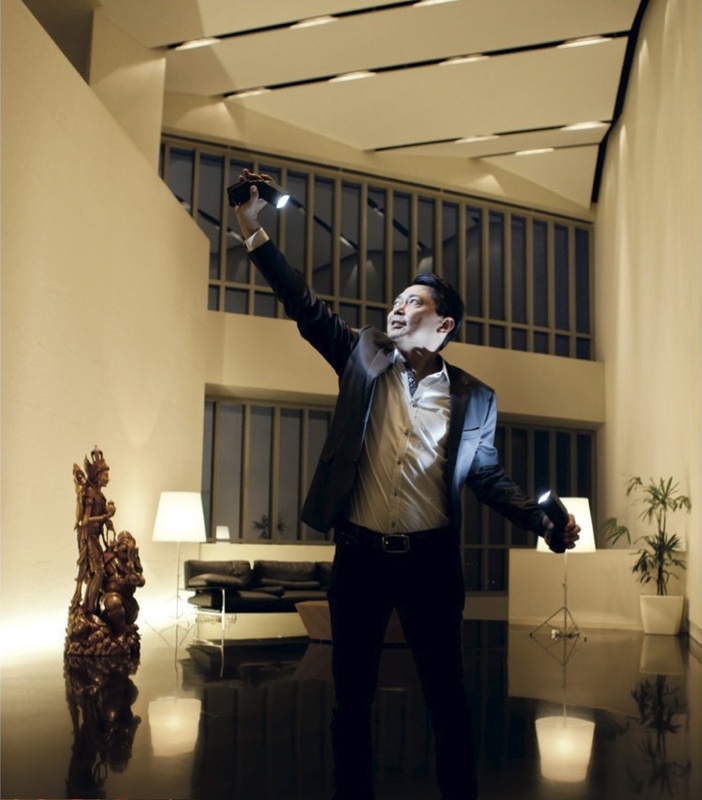 His firm is in a specialized branch of design even on a global scale, and even rarer in Indonesia, as Litac is one of the few that specializes in lighting and acoustical design. “Consciously or not our mood is influenced by the lighting around us. At a hospital, for instance, the lighting should make people feel healthier or at home it should make them feel more comfortable and relaxed,” says Paul. Look at any picture of a major city at night—some buildings are just dark towers, while others stand out, such as the Empire State Building in New York City or the Sydney Opera House in Australia. At night, these structures are bathed in light designed to highlight them against the dark night sky. Such lighting is no accident, it is the work of a design firm. Lighting and acoustics can be considered as much a part of a structure’s architectural design as items such as doors or windows. Such design by lighting—both interior and exterior—is part of what turns an urban landscape from something mundane into one that is visually interesting and attractive. It can give a sophisticated edge to a city. Litac has also done a number of interior designs, such as the Social House restaurant, the offices of McKinsey consultants, Central Park mall, the National Museum, and even the Gereja Katedral. It has done projects in Jakarta, Bali, Medan and Surabaya as well as in China and Singapore. 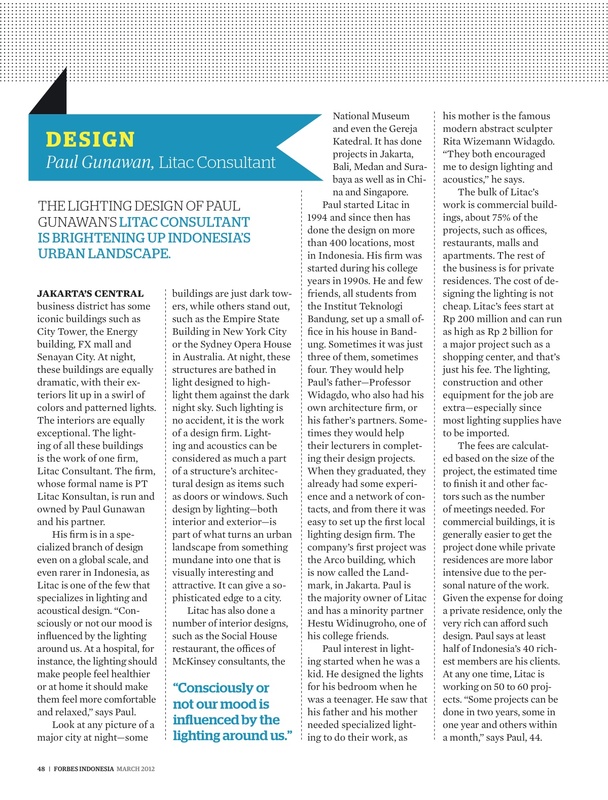 Paul started Litac in 1994 and since then has done the design on more than 400 locations, most in Indonesia. His firm was started during his college years in early 1990s. He and few friends, all students from the Institut Teknologi Bandung, set up a small office in his house in Bandung. Sometimes it was just three of them, sometimes four. They would help Paul’s father—Professor Widagdo, who also had his own architecture firm, or his father’s partners. Sometimes they would help their lecturers in completing their design projects. When they were graduated, they already had some experience and a network of contacts, and from there it was easy to set up the first local lighting design firm. The company’s first project was the Arco building, which is now called the Landmark, in Jakarta. Paul is the majority owner of Litac and has a minority partner Hestu Widinugroho, one of his college friends. The bulk of Litac’s work is commercial buildings, about 75% of the projects, such as offices, restaurants, malls and apartments. The rest of the business, about a quarter, is for private residences belong to very wealthy people. The cost of designing the lighting is not cheap. Litac’s fees start at Rp 200 million and can run as high as Rp 2 billion for a major project such as a shopping center, and that’s just his fee. The lighting, construction and other equipment for the job are extra—especially since most lighting supplies have to be imported. The fees are calculated based on the size of the project, the estimated time to finish it and other factors such as the number of meetings needed. For commercial buildings, it is generally easier to get the project done while private residences are more labor intensive due to the personal nature of the work. Given the expense for doing a private residence, only the very rich can afford such design. Paul says at least half of Indonesia’s 40 richest members are his clients. At any one time, Litac is working on 50 to 60 projects. “Some projects can be done in two years, some in one year and others within a month,” says Paul, 44. Litac is the biggest in its field in terms of number of employees, with 25 staff. “Hopefully also in terms of revenue,” he adds, although he doesn’t say much else about revenues except that the work is not as lucrative as it appears. Paul oversees all the work that Litac gets. “I know exactly what we are doing. I take all the responsibility for the final result, whether good or not,” he says. He would like to groom a successor to hand over the company but says that it is difficult to find someone who has the right appreciation for lighting design. A key element is the initial research to survey the site, to understand how best to build the lighting and acoustical design. If one doesn’t pay attention to the details, Paul says, it produces a subpar result. The problem of finding the right people is limiting Litac’s ability to expand. So far, Paul has been unable to open another office aside from his one he has in the Senopati area of Jakarta due to lack of staff. Paul notes that many developers don’t understand the importance of lighting and acoustical design, and are reluctant to budget for this item. However, he feels awareness is growing for relevance of what he does. Many used to feel lighting just had a single purpose to help you see at night or in dark places. Now the public sees that good lighting can create an emotional response as does the right acoustic design. It helps market a location and creates a stronger impression with consumers if a building makes a dramatic visual statement. 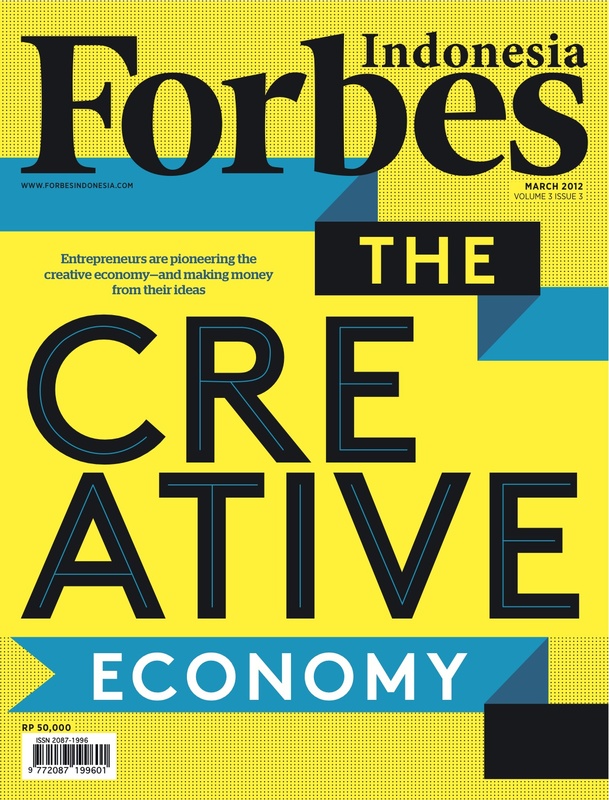 “As the economy grows, so does the need for creative industry that have passion,” says Paul. 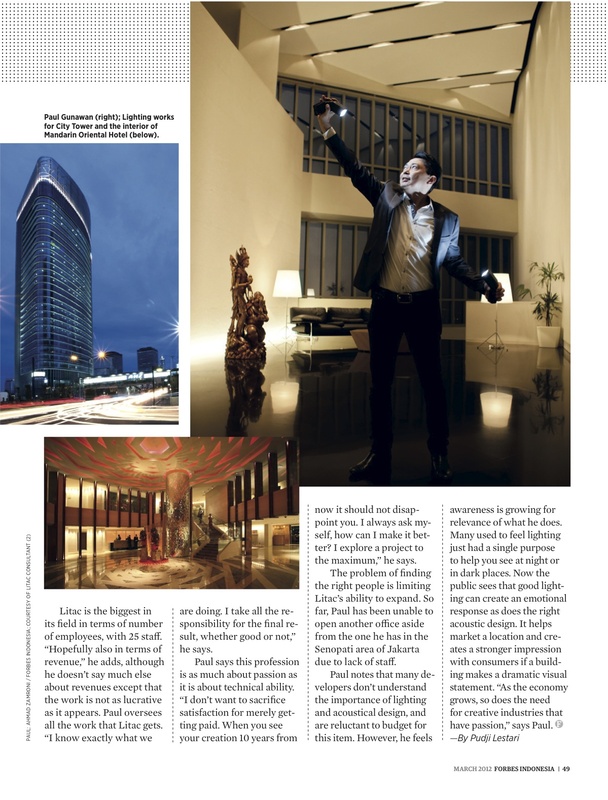 * This story appears in the March 2012 issue of Forbes Indonesia magazine. The grey highlight is added later for the blog. This entry was posted in Companies, Ideas, Publications and tagged Central Park Jakarta, City Tower, FX mall, lighting and acoustical design, Litac Consultant, National Museum, Paul Gunawan, Prof Widagdo, Rita Wizemann Widagdo, Social House restaurant, The creative economy, the Energy building by Pudji Lestari. Bookmark the permalink.